I hope you are travelling well. I just wanted to remind you (or let you know) that I have transferred all of this Transcending blog over to my new site Quiet Writing. There are many new posts over there on all things transcending, transition, resilience, intuition, writing and creativity. So if you haven’t already visited to sign up for Quiet Writing – now is the perfect time as I have just released my new free ebook: 36 Books that Shaped my Story: Reading as Creative Influence. I’ve included the full post for you here below as well but would love to see you over at Quiet Writing and to engage with you there. There is a rich community building and interacting and new opportunities, including inspirational resources, Life Coaching and guest blog posting, coming on line all the time. This will be my last communication from here and I’ll be shifting Transcending over to private mode by the end of September. So I hope you will come and join me at Quiet Writing if you’ve joined up more recently or haven’t made the leap as yet! Thanks so much for supporting Transcending over the years and recently – but it’s time to move on after a year of publishing at Quiet Writing. You can read the Welcome to Quiet Writing message I sent out about a year ago if you missed it at that time. 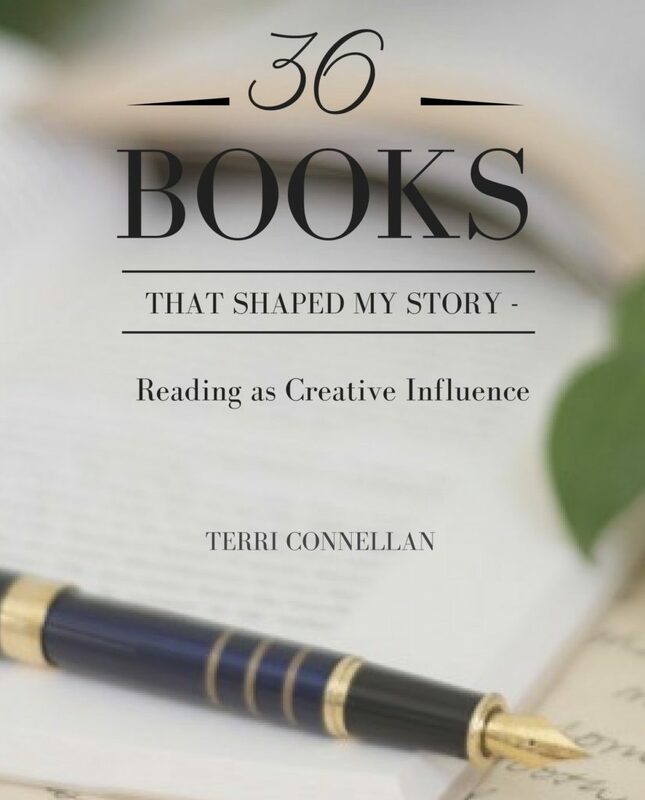 My free ebook ’36 Books that Shaped my Story: Reading as Creative Influence’ celebrates the books we love as our creative legacy and the clues they give as to what is emerging in our story. I’m so excited to be launching my ’36 Books’ ebook and sharing the story with you! When I started working out what to include as a special gift and free ebook here, I wanted something that summed up the heart of Quiet Writing. I wanted to create something that sparked creativity, that shared generously and that provided a springboard for others for their own reflections on their lives and creativity. And I kept coming back to books – sharing books that made a difference to me, sharing how they influenced me and shaped my life, reflecting on how this can be a source of growth. Words are at the heart of Quiet Writing – the words we read, the words we write, the words we say to ourselves or another person such as a trusted friend or coach as we form our vision and process our journey. The words we listen to as we read, as we engage with another fully and the words we want to write. And story is the shape the words make – the narrative we weave through the body of work that we create through career, our creative endeavours and our passions. This story is unique – no one has read the same books as you in the same way; no one has the same life experiences as you; and you are the only one to combine your passions and experiences in the way that you do. I have always been magnetically drawn to the books I need as teachers. Recently I cleared a shelf and, with great reverence, placed on it the books I most love – the ones that have shaped me in the way that water shapes stones, almost imperceptibly over time. She invites us to gather the books we most love around us and to sit with them and appreciate how they have influenced our vision and sense of direction, especially in our writing life. I wonder if that’s really all our writing asks of us: to know what we love, to listen, and to give ourselves over to what presents itself. So that’s what I did – I gathered the special books that have shaped me over time and spent time with each of them, honouring what they have brought to me. And it became a fascinating and deep exercise. Choosing them, remembering what they have given me, unpacking and unravelling it a little more, organising it into a continuum and seeing how it fitted in the context of my life – was an insightful joy. And I learnt so much about myself and the recurring themes in my life. It became a deep excavation and navigation of what I love and how it drives me. And that is the heart of Quiet Writing – it’s about gathering the threads of our lives, finding the connecting pieces and weaving them together. I communicate this heart and this spirit, through writing and life coaching, the twin hearts of Quiet Writing, so we can work with it in a supportive way to shine. For when we find those connecting pieces, those values, those desires, those long held passions and values, they can help us negotiate the next phase more successfully and work out what we really want to do and feel. So what can you expect in ’36 Books that Shaped my Story: Reading as Creative Influence’? It starts with a personal essay about the rationale and process and draws the threads of the experiment and experience together into key themes. The second part then tracks through each of the 36 books individually and shows how they appeared in the context of my life and the legacy and influence they have provided. There are also suggestions as to why you might want to read each book. the key to the influences that are your guiding light. I think will find it a valuable read about the value of books and reading as creative influence and as a way of finding clues to help you enrich your quiet writing life. So if you already a Quiet Writing subscriber, the link will already be with you in your inbox via the ‘Beach Notes’ monthly message I have sent out. If you are not already a subscriber, make sure you sign up to connect and receive ‘36 Books’. Just sign up to the right or bottom on Quiet Writing and the ebook will be with you in no time. You will also receive my regular ‘Beach Notes’ newsletter full of inspiration about books, writing, story, narrative, voice, personality and all things quiet writing to inspire you. You will also be the first to know about Quiet Writing life coaching, guest posting and e-course opportunities when they are available. I hope you enjoy ’36 Books’. It’s an opportunity for us to reflect on and share our thoughts on reading, books, creativity, influence, story, narrative and writing. These are all fabulous inspirations central to Quiet Writing and the community here. I can’t wait to hear your feedback – happy reading and reflection! A special hello to all Transcending readers and subscribers! It’s been a little quiet here as I have taken time over the past year to think about Transcending as a blog and its future and focus. I’m excited to let you know that Transcending has transformed into a new blog and focus, Quiet Writing, that has recently launched into the world. Transcending has been a critical space in the world for me: a place to write, create and connect with like-minded others, borne out of challenging times. I hope it’s also been of value to you. It’s been important for me to value Transcending, to keep it intact as the heart of the new blog and to build on the work of these times, crafted over more than 6 years. The key theme and messages remain consistent but they shift to a new level and look. Quiet Writing is also the heart of a new creative life and business focus at this time. Whilst Transcending has shifted over and is held within the new blog, the subscriptions it seems have not. So if you would like to learn about where Quiet Writing is heading and to keep in touch, I encourage you to read this Welcome to Quiet Writing post and to sign up by email from there so that we can keep connected. I have many exciting adventures planned for the future. A big thank you to those readers who have already signed up to the new space. An exploration of contexts such as leadership, innovation, productivity, planning, strategy and managing introversion in public roles. And into the future, I am planning much more, with Quiet Writing being the core of a heart centred gathering of like minded people with sharing of influences and connections to bring us all alive. I thank you all so much for your support of Transcending over the past years. Your support has kept me committed to writing and creating through the busiest of times in a spirit of transcending, rising above, cutting through and connecting. And I have very much valued our connection and sharing of influences. These threads remain the heart of Quiet Writing and I hope to see you there. I’ve been working away from home and travelling a lot as part of this work role. This past week, I was in a different town pretty well each night. So it was with much pleasure that I arrived home on Friday night with a few days in my blessed and special home and village. It’s hard to describe what makes a sense of home but loved ones being there or close by is a central ingredient. For my home and village, it’s the sunshine, the water, the birds that visit that like the kookaburra above who joined me for my breakfast on my return, my personal library of favourite books, the feel of familiar carpet and river slate tiles under my feet, my own bed, a warm bath and trees outside every window rustling in an early August breeze. And it’s all blissful. I’m lucky. I live in a special place, a village I choose to call home that is surrounded by beach and bush. As an introvert who works hard with many people interactions in my day job, both my village and house are places of retreat and recharge. A place to rest, walk, feel the sand under my feet and the water flowing over them; a place to read, write, reflect; a place of solace and replenishment; of good food, words and wine; and a place to be myself with people who love me. Being away so much and coming back, it’s easy to focus on what is not right: the weeds in the garden beds; the renovations still not finished after months of weekend work; the stuff that’s not tidy or finished; the clutter here and there. But this weekend has been about focusing on what is right and perfect now in this house, this village, my life: a loved and loving partner; a gorgeous independent daughter with so many skills, passions and opportunities; my gentle beautiful mother; the view, the trees, the beaches and bush, the books, the creative inspirations and connections and my independence to explore it all. My daydreams are nearly all of country cottages, of little gardens, of ‘settling down’ with flowers in vases and coloured curtains. I don’t think of backaches, dish washing. I want to live amongst things that grow, not amongst machines. To live in a regular rhythm with sun and rain and wind and fresh air and the coming and going of the seasons I want a few friends that I may learn to know and understand and talk to without embarrassment or doubt. I want to write books, to see them printed and bound. And to get clearer ideas on this great tangle of human behaviour. I also remember that the book I am currently reading is ‘Coming Home’ by Rosamunde Pilcher. Home and the significance of its sense of place in the midst of coming and going and change is clearly on my mind and I am seeking its comfort in both a physical and spiritual sense. I take these reflections with me as I head into a new week and new month full of opportunity. The recent announcement of the lost novel from Harper Lee, the unpublished unknown predecessor of ‘To Kill a Mockingbird’, written before, that tells us the next step in the story, raised many questions. Firstly it seems incredulous that this could be so. That such an archetypal novel had an earlier sister and that it took the events further was a surprise. How could we have not known all this time? Where was this novel? Why was it not published before? Then later that some day, the announcement of a new novel by Milan Kundera, author of ‘The Unbearable Lightness of Being’, again such an archetypal novel and one that had a profound effect on me in the late 80s, accompanied by an amazing film. Now another novel by this great author is to come after a significant silence of more than a decade. It set me thinking about the ‘inevitability’ of novels, about the novels that get lost (see this article on delayed and lost novels – especially one that got lost in the post! ), the novels that are found, the ones that get delayed for a long time. And the ones that risk not being written at all. It brought to mind ‘The Guernsey Literary and Potato Peel Pie Society‘, “a first novel from a 70 year old former librarian, Mary Ann Shaffer”. According to the book’s bio, Mary Ann first became interested in Guernsey in 1976; then many years later was goaded into writing a book and revisited her thoughts about Guernsey. Mary Ann died in 2008 without seeing her book in print and knowing the fame it enjoyed and the pleasure it kindled in others. “Creative work is not a selfish act or bid for attention on the part of the actor. It’s a gift to the world and every being in it. Don’t cheat us of your contribution. Give us what you’ve got”. So many endless possibilities, so many chances. What untold stories ask to be written and how can we make sure they come to light and don’t get lost or forgotten? At the beginning of this week, my partner Keith said to me, “How would you like to go to dinner in Mudgee on Friday?” This, an invitation to go away for the weekend at short notice, to meet some other practical needs but also to have a much needed break and change of scenery. Usually needing weeks of notice for such things so I can plan ahead, my eyelids fluttered and I came up with a few reasons why maybe it wasn’t a good idea. Some of these were real. Once sorted through, we booked a guesthouse a few days in advance for the weekend and headed out of the city on Friday afternoon. It was lovely to be leaving the city. We hit the city outskirts and climbed the mountains, making our way through fog and the sound of bellbirds as we wound our way west. Before too long we were heading towards our destination as the sun was going down. The open landscapes darkened as the sky turned into blue-grey dusky-pink tones making a back-drop for the shadows of trees. We arrived about 7:30pm to find our beautifully warm and inviting guesthouse with every detail in place, like bush flowers on the centre of the enormous dining table. We headed out shortly after arrival for the promised dinner date, ending up at a wine bar with a rustic and modern feel. We immediately enjoyed settling in after our travels with music, great food and good local wine. The next morning we woke to find out more about where we were. We found a clear open landscape with the bluest of blue sky days waiting for us. Our hosts cooked us eggs benedict with mushrooms and the most divine hollandaise sauce and shortly after breakfast we set out for a further drive of two hours to Coonabarabran. We drove through many small country towns like Mendooran and Dunedoo. Driving through, the local Mechanics Institute Hall at Mendooran founded in 1935 caught my eye. So lovingly cared for, it stood in stark contrast to many of the other faded buildings in town. The Mechanics Institutes were the early forerunners of technical and trades education and my great, great, great grandfather was a founding member of one in Goulburn. There were signs painted on the sides of buildings evoking times past surrounded by growing grass and weeds. We headed back to Mudgee and a late afternoon winery visit, tasting organic wines and sharing a grazing plate of fetta cheese, olives, prosciutto, rocket, sun dried tomatoes and crispy bread. There was an exceptional organic rose of the most pure colour especially when contrasted with the bluest of skies. We returned to our abode in the shadow of mountains to the sun going down and the opportunity to quietly enjoy the guesthouse all to ourselves. It was the most precious weekend and I feel rejuvenated. 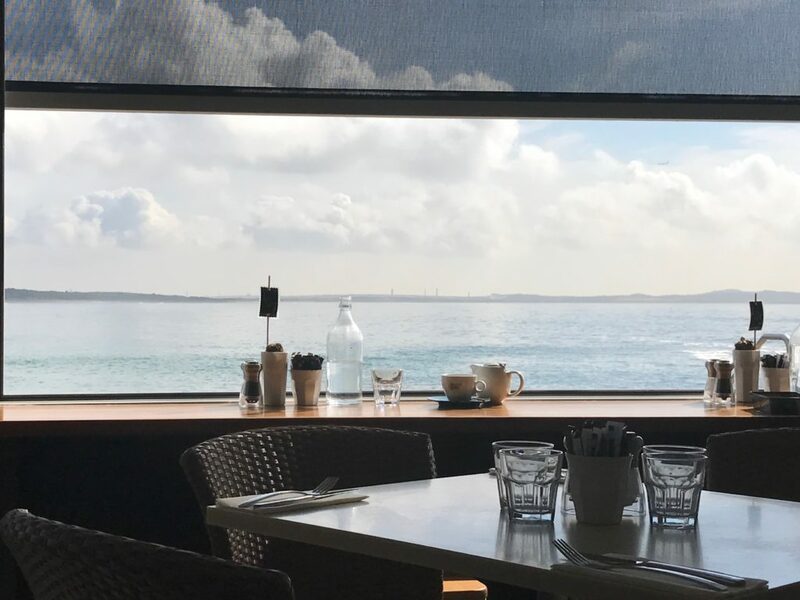 It made me realise how much a change of scenery can stimulate the senses and be an invitation to relax, reflect and be open to new opportunities. There’s a time of transition coming up again and I’m ready to embrace it now with a calm heart. It’s International Women’s Day and I’m sitting here on a sunny Sydney Sunday listening to women’s music on the radio – flipping between Double J and Triple J – and thinking about reading Australian women writers. It’s my fourth year of participating in the Australian Women Writers’ Challenge and I thought I’d take a few minutes on this IWD to reflect on my experience of reading Australian Women Writers via the challenge. 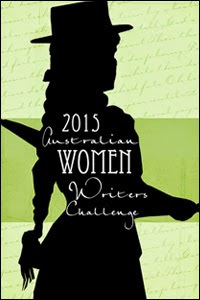 The challenge is about enjoying, supporting, sharing and promoting Australian women’s writing. If you want to know about the challenge, you can read more about it here: Background to the Challenge. And you can sign up for 2015 here: Sign up to the Challenge. Started by Elizabeth Lhuede in response to gender imbalance in books reviewed, in reading preferences and choices and in award representation, the challenge has created a groundswell of readers, reviewers, bloggers and tweeters making a conscious choice to read, review, communicate about and celebrate books written by Australian women. Now in its fourth year, the challenge has resulted in thousands of Australian women writers’ books being read and reviewed and national and international recognition of its quiet achievements. The Australian Women Writers’ Challenge is part of a world-wide movement to raise awareness of excellent writing by women. It helps readers to challenge the subconscious stereotypes that govern our choice of books to read. I’ve signed up again in 2015 because it’s now an integral part of my reading choices and I continue to be inspired and excited by Australian women’s writing. I’ve enjoyed diverse reads over 2012 to 2014. There are so many Australian women writers’ works I simply would not have noticed or enjoyed if not for the challenge. The challenge has made me seek out new Australian women writers, revisit writers I’ve enjoyed and kept my antenna up about their successes, awards and commendations within the circle of women’s writing and beyond. It’s kept my writing heart alive and is an inspiration as I read; a message that I am also able to write and create, express my stories and find space for my narratives in whatever form. As my heritage, it’s where I can find linkage, possibilities and a springboard for creating. I’ve written about that here and here adding my voice to the space. In terms of participation, my reading lists are not enormous – around 6 to 7 books a year, but they are steady and growing. I’ve struggled to write the reviews as I would like, but I’ve engaged with the reading and with the AWW community via social media. I’ve contributed that way and made some great online connections with Australian women writers and their readers that have enriched my reading life and beyond. You can participate to whatever level you can manage and the pleasures and learning are immense for that investment, raising awareness of reading choices and celebrating narratives and works by Australian women and inspiring women to find their voices through reading the voices of others. It’s no light-weight endeavour. These are to me the voices of creative possibilities and I treasure them. Many of these books were picked up because I was looking for Australian women writers’ books in libraries, shops and online. I possibly would not have read ‘Light Between Oceans’, ‘Poet’s Cottage’, ‘The Longing’ or ‘Claustrophobia’ if not for the challenge and these have become some of my favourite reading experiences of the challenge so far. I have deliberately read across genres and so if not for the challenge, may not have enjoyed the beautifully science fiction inspired, ‘When We Have Wings’, the Celtic fantasy world of ‘Sea Hearts’ or the weaving medieval narrative of ‘The Scrivener’s Tale’. I’ve been more aware and more excited when Australian women writers have been nominated, short-listed and won awards for their books and I’ve sought out the books to see why they were celebrated in their achievements, especially ‘Questions of Travel’, ‘Burial Rites’, ‘Mateship with Birds’ and ‘All the Birds, Singing’. In 2015, I’ve already read the exquisitely tender ‘The Golden Age’ by Joan London and have Annabel Crabb’s ‘The Wife Drought’ lined up to read. I’m keen to read Clare Wright’s ‘The Forgotten Rebels of Eureka’ and also read some writers I haven’t read like Sonya Hartnett, Geraldine Brooks and Liane Moriarty. It’s been a rich journey and I encourage you on this International Women’s Day to seek out the voices of women writers that excite and sustain you wherever they may be. 3. A condition or period of maximum development. My word for the year in 2014 was ‘blossoming’.When you choose a word for the year, it’s about intent. Though sometimes as the year evolves, you can forget about this intent, sometimes even forget the word itself as busyness overtakes. But somehow this intent weaves its subtle way and the results might not be exactly as you thought.On the surface, last year didn’t feel like a year of blossoming. It felt more like a year of ploughing, preparation, perspiration and intense hard work. But looking at the definition: “a condition or period of maximum development”, “producing flowers”, it’s possible that this was the underlying development phase of fruits and flowers to come, the value of which might be better understood in hindsight at a much later date. Blossoms won’t happen without this work, this preparation for the future, this investment in growth. Reflecting further, I see that the blossoming may in fact have been very long term and much deeper than I realise. In just over a year from writing those words, I gave birth to my beautiful daughter.And for much of this past year, she has lived in Japan, studying, living independently and so happily, developing her already excellent Japanese language skills, travelling, interacting, learning, making many new friends, thriving and growing into the most beautiful woman I am so proud of. Watching this blossoming mostly from afar has been the greatest achievement of 2014, if hard at times because of distance. This letting go also part of my own growth. So not so much my own blossoming and achievement, much more my daughter’s this past year, with her growth and flowering becoming my growth and flowering: the longest term of blossoming and the deepest expression of love. A precious realisation. My word for 2015 is ‘flow’. When thinking about my word and focus for 2015, I knew it had to be something to do with creativity, writing, poetry and actually producing more tangible results. When I reflected and searched for what would make this creativity happen, it kept coming back to flow as the essential active ingredient. Exploring with Pinterest I found more connections and associations, many tapping into special experiences and key symbols, like all was gathering around this word as a focal point for now and into the future picking up on the energy of the past. So what’s flow all about really? It’s about capturing the creative moment, being in the energy of it and enacting this. It’s what you see, what you notice on a walk, looking up and around you. It’s what you pick up from the beach, it’s what you find on the bed of the sea-shore as you dive beneath the shallow waves. It’s shells, rocks, birds, trees, the sound of cicadas in the background, aboriginal carvings, ancient landscapes, your feet in the sand, your skin in the water. It’s what comes to you – symbols, associations, ideas – what you notice and connect, and the process and product of what you do with what comes. It’s the energy kindled inside of you and the creative parts of you sparking again. It’s the promise of engagement with a wider flow of chakras, shakti, chi, oracles and your place in the energy of the world. It’s knowing that the steps to get there are within reach, knowing that you have the know-how, that you recognise the pieces and components to connect and focus on from the sequence of days and years you’ve already traversed and invested your time and energy in. You know you’ve just got to harness this in a productive way and find the flame to ignite it all. “Going with the flow isn’t about being passive or lazy. It’s not about just letting things happen “to you”. It’s not aimless wandering. It’s a co-creative act. It looks like an exciting journey with my word of the year in 2015. I know others have also chosen ‘flow’ as their word for the year and I look forward to sharing the journey with these special fellow travellers. What words are showing up for you for this year and what are they suggesting? Would love to hear! This past week was long and difficult. Monday last week started as it usually does – off to work, getting organised for the week and at this time, getting ready for Christmas celebrations and a final busy week before winding down for the festive season. About 10am on that Monday, everything changed with the news of the siege close by in the Lindt Cafe in Martin Place. Like many other Sydney workers, I found myself in lockdown, then being evacuated, then unable to return to the workplace. And emotionally connected to the unfolding events. The overwhelming feelings were of horror for the hostages and intense terror for their helplessness and fate. Like much of the country, I watched for hours into the night, breath held in a surreal landscape of fear of what might happen. The early hours brought the news of the tragic outcome. In the following days, the mood has been sombre, a different atmosphere on the train into the city, a sense of collective sadness. The flowers cascading their way down Martin Place reflecting this. Many of us, it seems, have in our individual ways reflected, been touched, reassessed much. For me, the return to my office and buying my morning coffee filled me with sudden and overwhelming emotion. The ordinary every day action of so many Sydney-siders suddenly poignant in the aftermath. The sense of vulnerability, that it could have been me or so many people close to me. The harsh reality of its randomness. The collective response has been heartening though sad: the growing sea of flowers reflecting the grief of so many individuals pieced together; the emerging sweet fragrance in the air; the multi-faith ceremonies and statements of support and the solidarity across religious boundaries that re-emphasise that we are all one community; the wave of support for Muslim women and others possibly affected by intolerance arising from this event. 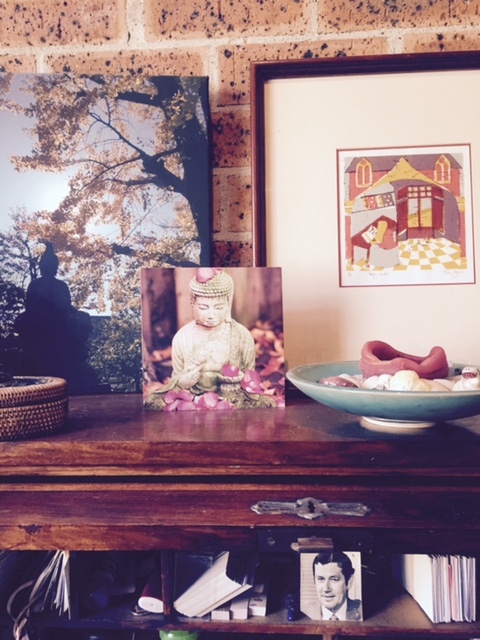 I have engaged with Susannah Conway’s December Reflections, 2014 this month. It has been a wonderful opportunity to reflect on the year and as always with Susannah’s initiatives, a chance to reignite our own creativity and look around us with new eyes. At the end of the week, the day 20 prompt in December Reflections was “this year was…”. I have to say this year has been intense for many reasons. But as the events of recent days have reminded me, there is much to be thankful for: supportive and loving family, friends, work colleagues; having a beautiful city in which to live and work; summer arriving; creativity always; books to read; maybe books to write; and the power of collective feeling.. This year and these past days have reminded me of what is of value. of the sun going down. its way under winter’s skin?